The Bush de Noël was introduced in 1991 to respond to consumer demands for the ideal beer to add lustre to their end-of-year celebrations. The Bush de Noël is brewed solely from malts, hops, candy sugar and water. It is a filtered, top-fermented beer with an alcohol volume of 12%. The use of caramel malts produces a copper-coloured beer with a full, rounded taste. 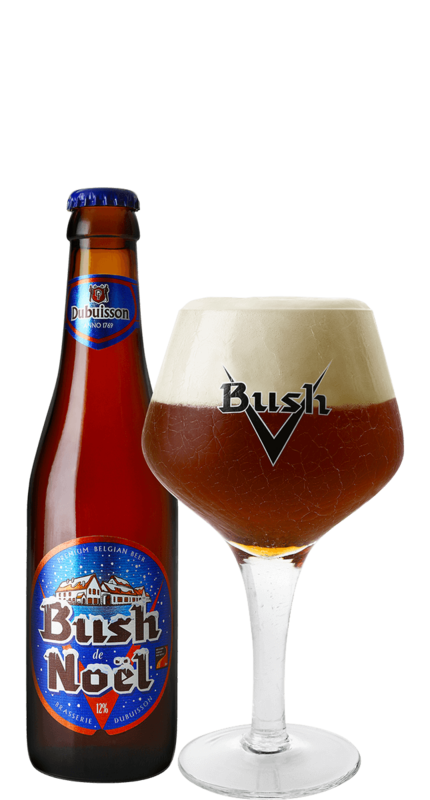 The Bush de Noël owes its fruity taste and subtle hop aromas to the well-thought out choice of hops in this brew. The Bush de Noël is brewed in limited volumes but has already achieved the status of a classic beer for the end-of-year celebrations. The Bush de Noël is amber in colour with aromas ranging from banana and pineapple to caramel and dried fruits. The Bush de Noël is full, rounded and beautifully dense. It has a slightly bitter taste with an underlying sweetness, yielding to aromas of caramel and praline and rewards the drinker with a satisfyingly long finish.